Value-adding system for minimal investment. 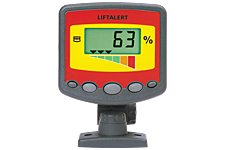 Maintains truck lifting capacity and driver visibility. LCD indicates % read-out and bar graph of load status. Initial audible alarm at 90% of permitted load and continuous audible alarm and flashing display at 100% and over.